If the Far Cry 5 skill tree were an actual tree, it would look like this. There are plenty of similarities between Far Cry 4 and 5. Despite their different geographic settings and narrative sensibilities, they look, feel, and sound about the same, and feature similar arsenals and enemy-types. However, character upgrades work very differently. As you play Far Cry 4, you earn points that you can use to unlock new abilities. Abilities branch out along a bunch of four-tier paths, and you can only unlock a second-tier ability if you’ve unlocked a first-tier ability. Far Cry 5's skill page. There are actually around the same number of individual nodes, but several of the skills are carried over from Far Cry 4's crafting system, and others are for the game’s new follower characters. In Far Cry 5, you also earn points that you can use to unlock new abilities. At first glance, the skill page appears to contain a similar number of nodes (50 to Far Cry 4's 48), but that’s mostly because the earlier game’s crafting system has been entirely removed, and some of the things you used to have to craft for (holsters, ammo capacity) are now on the skill page. Ten of Far Cry 5's skills are follower-specific skills, as well. You can unlock most of Far Cry 5's upgrades in any order, which is a nice change from the previous game. A few require you to have unlocked a preceding ability (usually because they modify or enhance the first ability), and a few others require you to have done something in the world—defeat one lieutenant, get your resistance meter to a certain level, etc. In general though, the upgrade tree isn’t a tree at all. It’s more of a field. What all of those abilities have in common is that they’re not really “abilities” at all. They don’t feel like upgrades. It feels more like your character starts out with a bunch of debuffs that you gradually remove in order to get to a reasonable base level. Some of those skills, like firing while moving a body, are things you can do in just about any first-person shooter. Others, like auto-looting on a stealth takedown, are basically convenience upgrades, where you’re spending points just to remove busywork. All of them shouldn’t really be skills you need to save up and buy. 2016’s prehistoric Far Cry Primal is an oddball when compared with the mainline entries in the series, but its upgrade tree is more in line with Far Cry 4 than 5. In fact, in some ways it’s the most convoluted character upgrade system in the series. Of the remaining Far Cry 4 abilities that have carried over to Far Cry 5, some have been lumped together or otherwise streamlined: several of FC4’s special takedowns (chain takedowns, sidearm takedowns) have been combined into a single takedown skill, health kits replenish all your health and don’t need to be upgraded, that kind of thing. Others have been removed: there’s no takedown-drag in Far Cry 5, nor are there vehicle takedowns. They also cut the “Elephant Rider” perk, for obvious reasons. The overall effect is that your character starts out with a reasonable skill-set and most upgrades actually feel like upgrades. In Far Cry 2, you’re basically just a dude with a couple guns and a map (and malaria). This whole Far Cry upgrade-a-palooza began with 2012’s Far Cry 3, which introduced the notion of unlockable character skills to the series. 2008’s Far Cry 2 had no character abilities or skill-trees at all, and the few permanent upgrades you’d unlock were tied to equipment and storage crates you’d buy at weapon dealers. 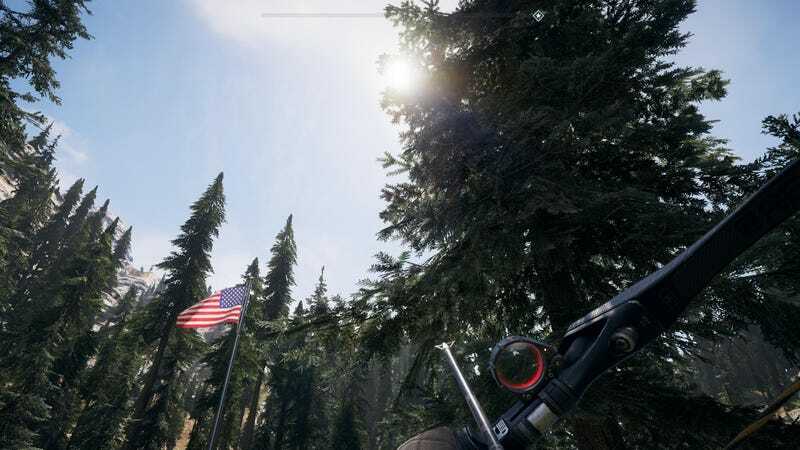 By filtering out so many of those abilities, Far Cry 5 actually brings the series closer to Far Cry 2 than I would’ve expected, though it’s still a hell of a lot busier than the 2008 game. I played a bit of Far Cry 2 after finishing Far Cry 5, and was impressed by how stripped down and basic the older game feels in comparison. Along with all the other things I like about Far Cry 2, it was nice to play a Far Cry game without having to think about my progress along a dozen different upgrade paths. Taken together, the Far Cry games illustrate how Ubisoft’s developers have changed their approach to character upgrades over time. For years, they steadily added more and more crafting, skills, and perks to these games. It appears they’ve finally begun to pare things back. I hope they keep going in this direction, since Far Cry games have become awfully bloated over the years. Who knows? Maybe Far Cry 6 will bring back the in-game map.